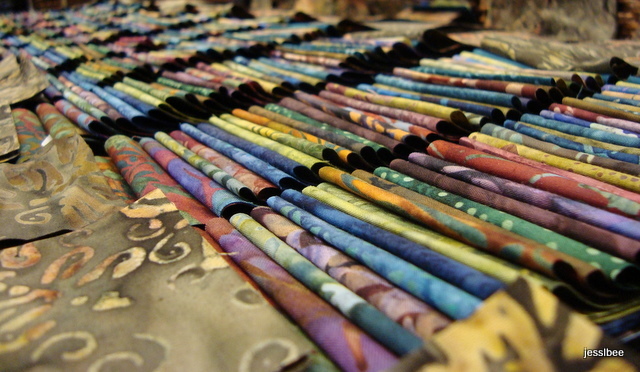 Ever since I was a young quilter I have loved batiks. My first recollection of them was when I was entranced by a quilt made up in bright batiks. Maybe it was just the unique pattern. It could have been the color combination but all I know is that I was hooked. This love has expanded to such a degree that I will look upon a day at work as a good one if I get to work with batiks. Almost every batik I pick up gives me a secret delight. Each piece is uniquely beautiful in its own way. Hand-dyed in exotic countries like India and Indonesia, each piece is different due to the dying process. Even with the same piece the variance of tone and color can be so different contrasting sharply with the ordinary cottons that quilters have within their reach to use. When a customer comes in to the shop on a mission to pick out a new quilt, I almost always lead them to our batik section. They are on the top of my list when picking out a quilt for a customer. With batiks I am the most comfortable for almost without trying I can pull fabrics that blend beautifully together. As of now I really don’t have a stash of batiks…I think one day I will. 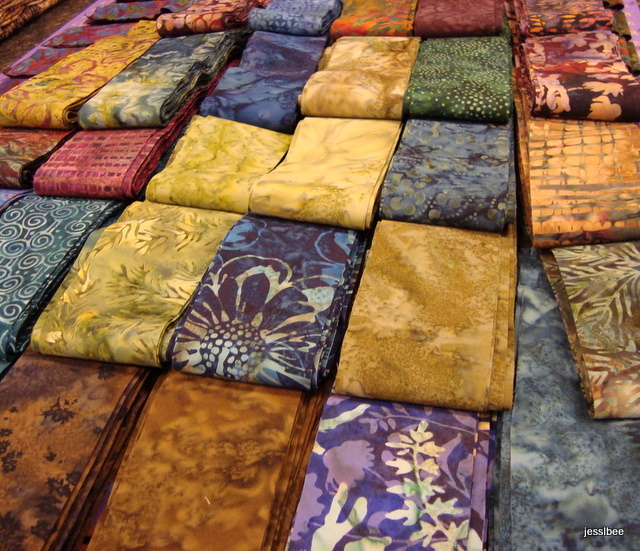 But for now I will have to content myself looking at the batiks at work…besides..there is no way I could have a batik stash that impressive!